Impressive, right? We thought so. In fact, I was almost speechless when I first saw these plans. We never knew our home had so much potential! The changes she included were two new Juliet balconies, three new windows, a new double door, a veranda, and the highly anticipated wing wall. My first instinct, after I finally took in all the changes, was that while it was very impressive, it was also felt very fancy. Too fancy for our family. It doesn't fall in line with the casual, inviting home style that we are trying to achieve. Our architect listened to our concerns and started doodling while we chatted (which, by the way, was by far the coolest part). In order to create a more inviting look, we removed the guard rail on the veranda and replaced the sconces with a hanging pendant. We also went back to the oval window over the front door, because behind that window is a toilet and no one needs to see that business. 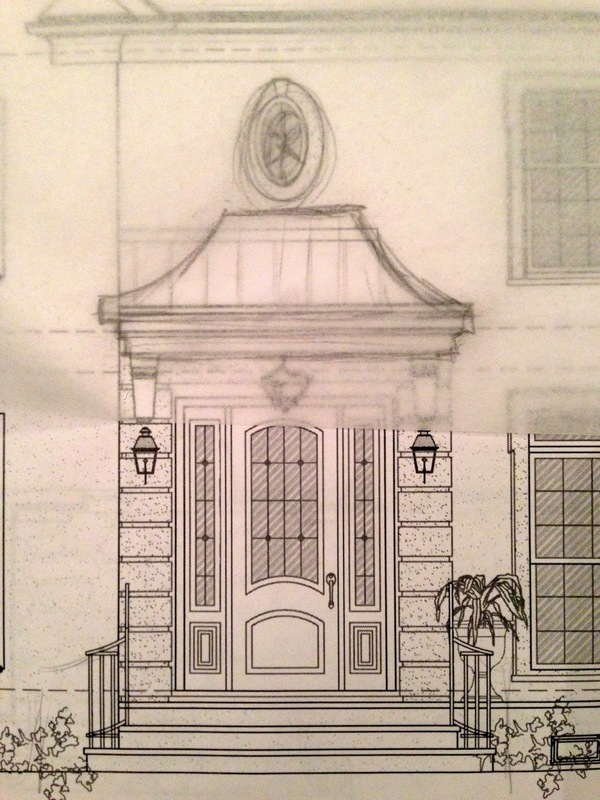 We threw around a couple more ideas, like removing the balcony entirely, and agreed that new drawings were in order. Here's where we stand now, option 3. You can see we are still debating the sconce vs. hanging pendant thing. You can probably also tell that we had a reality check and realized that although we'd love to pull the trigger on all the extra details, we are not made of money and some things had to go - like the new dormer window in the roofline, the two juliet balconies, and the wing wall (sniff). Unfortunately, we're still not 100% committed. I still have my heart set on something similar to this. Yes, this is my bad attempt at drawing something in. Clearly I am no architect. Needless to say, the debate continues. Wish us luck. And if you'd like to contribute your two cents, you know I'd love to hear it.